From commercial to backyard beekeepers the number one threat to the honey bee is Varroa Destructor Mites. Since 1987 assets coupled with research have amassed their focus in hopes of thwarting this pest. Harry Vanderpool, Oregon State Beekeepers Association President, made a remark in conversation which inspires this article. Interactions with other beekeepers finds a plethora of reliable mixed with unreliable information. Harry spoke of there being two chemical compositions associated with Oxalic Acid, only one appropriate for use in the treatment of mites. 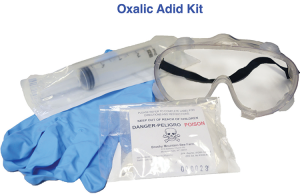 Oxalic Acid is an odorless white solid, colorless liquid which mixes in water and sinks. Naturally found in various strengths in plants, animals, and humans it combines readily with calcium. In fact, it is important to our metabolic processes of glyoxylic acid (from glucose) or ascorbic acid (Vitamin C). OA stimulates peristaltic or smooth muscle (intestinal) motion in our contractual movement in the elimination of our bodily wastes. Many of the foods we eat, such as rhubarb, star fruit, beets, chard, spinach, poppy seeds, black pepper, parsley, berries and beans have concentrations of OA. To place this in perspective, aspirin is considered a safe medication, yet it can result in death if improperly used, so it is with OA. Reading the accompanying information that comes with the product is vital. 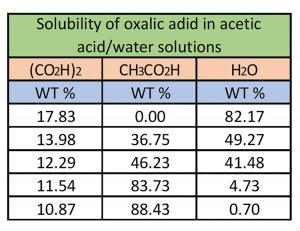 Anhydrous oxalic acid will crystallize near 50°C (122° F) from its solution in acetic acid/water mixtures provided the water concentration of the solution does not exceed 5.2 percent. Crystallization of the anhydrous acid at higher temperatures may possibly be achieved over a still greater range of water concentration if necessary. The invariant point of the system at 50.21°C (122.378° F) was found at a solution composition of 20.94 percent (CO2H)2, 73.89 percent CH3C02H, and 5.17 percent water. 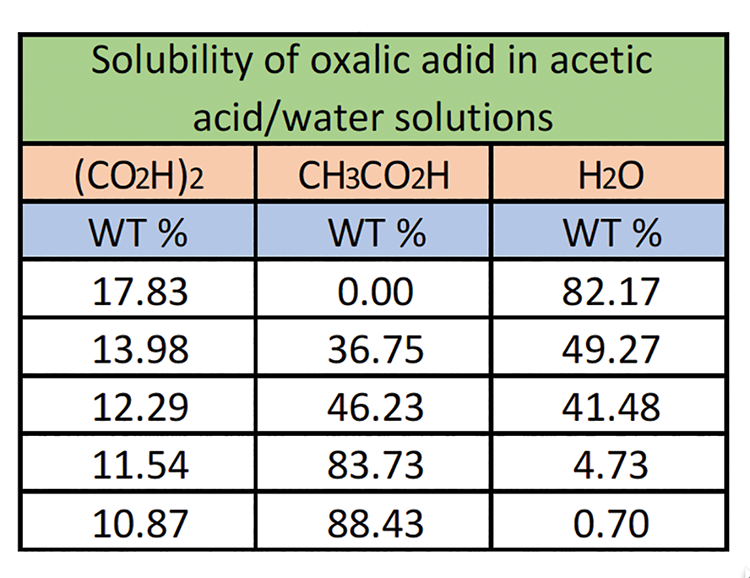 The chart demonstrates the relationship at 40°C influence on crystallization of anhydrous oxalic acid in the presence of water. Decreasing crystallization temperatures affects the crystallization of OA. The mode of action, although not clearly understood, seems to be through its acidity (pH near 0.9). OA crosses the cuticle of the insects and mites through the topical application being observed a few hours after administration. Another view is OA vapors enter through the soft pads of the mite’s feet and travels to the blood stream, killing the mite. It is also thought that it destroys parts of the mite’s mouth. And yet another is the honey bees consumes the OA disbursing it through it hemolymph to be imbibed by the mite. It is important to appreciate the mechanism of action remains cloudy. Two popular methods of application are Solution and Sublimation. Going back to our high school chemistry, if you can remember, there are three states (solid, liquid and gas). The act of sublimation transitions the solid crystals directly into the gas phase without passing through the liquid state. Most beekeepers refer to this as vaporization, but scientifically it is considered sublimation. Charriere and Imdorf (2001) reported in trials conducted by dripping on colonies without brood in Switzerland showed an average 97% efficiency for the solution of 45 g of oxalic acid, against 96% efficiency for the treatment of 30 g of oxalic acid. In slovenia, the efficacy of oxalic acid treatments between 8 August and 16 September was 41% (Gregorc and Planinc 2012). A lower dose of 10–15 mL/hive (3.5%) showed a good acaricidal effect (98%) when smaller colonies were treated (Moosbeckhofer 2001). Gregorc and Planinc (2001) treated colonies with brood three times in the Summer by applying 4.1–5.2% oxalic acid dehydrate in varying sugar solutions w/w corresponding to approximately 4.5–5.9% oxalic acid dehydrate w/v. An efficacy of 39–52% was achieved. Investigations from Canada in a climatic region comparing with Central Europe confirmed the results of autumn treatments: 2.8 % oxalic acid dihydrate solution (40–50 mL/hive) killed about 55% of the mites, 3.5% about 90% in colonies with remaining brood (Nasr et al. 2001). Efficiency of up to 100% was reached only in broodless artificial swarms (Büchler 1998). The method approved by the EPA and those States where is has also been approved call for the use of Oxalic Acid Dihydrate. Altering the concentration of OA directly effects the efficacy and bee mortality. 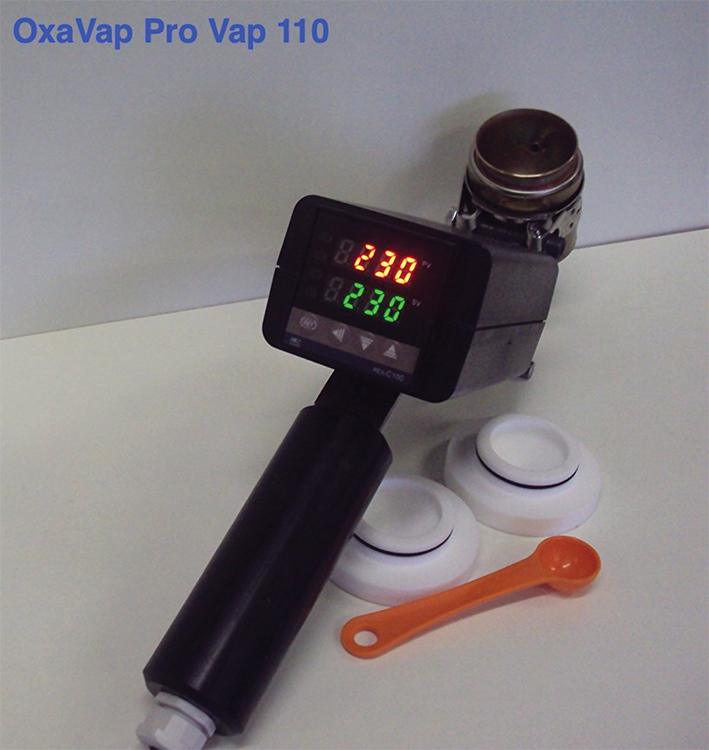 Sublimation – Place 1g Oxalic Acid Dihydrate powder onto the heat element of the vaporizer. Follow respective instructions of the vaporizer’s manufacture. Typically ½ teaspoon (2 g) is placed on the element. MORE IS NOT BETTER. Once the vaporizer is placed in the hive, and the exits/entrances are sealed, the electrical connections are attached to a 12 volt (15 amp) battery. The electricity heats the element thus converting the crystals through sublimation into a gaseous state. 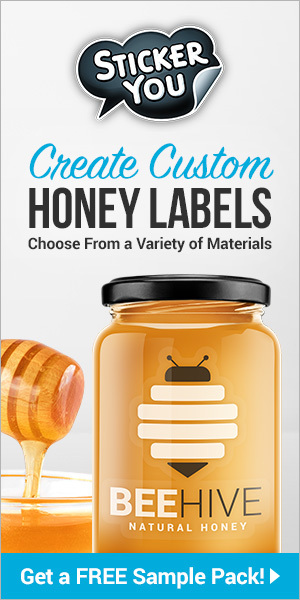 The length of time to apply heat is dependent on the vapor device, so read the instructions, but leave the device in the hive where it will continue to heat any remaining crystals. Construction of the vaporizer and the various states of age of the battery affect the application. One should “test fire” their respective vaporizer prior to using live on a hive to ascertain the length of time required for use. 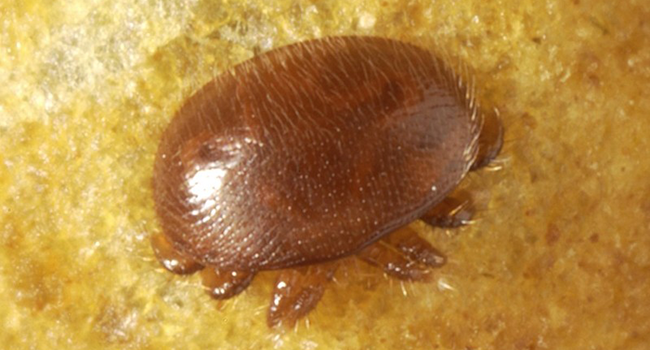 The largest mite drop occurs the day AFTER treatment. The solution method calls to dissolve 35g of OA in 1 liter of 1:1 sugar water (weight : volume). Key to this method is practicing on none active hive bodies with frames. Trickle or dribble 5 ml of the liquid between the frames which have bees present. No more than 50 ml should be applied to a double deep hive. DO NOT let OA come in contact with your skin, eyes, be ingested or inhaled. Although OA is found naturally in our foods, the concentration is significantly greater in its powder form. Spend the money and time to protect yourself – rubber gloves, safety goggles, long sleeve shirt, and breathing apparatus (EPA recommends an acid gas respirator model 6211 or mask with N95 filter) is critical to your safety. Oxalic Acid dihydrate can be VERY DANGEROUS for humans. If it were possible to absorb it, a few grams could kill an adult. OA vapors re-crystallize to cover all the surfaces in the hive, which if inhaled will carry to the lungs. OA is 95% effective in sublimation while the solution method has a greater efficacy. It is recommended to be applied during “non-brood” seasons (late fall, winter, swarms). OA will not cross the wax capping’s of the brood cells where a significant portion of the mites are found. It is very effective against phoretic mites. Honey bees have a low tolerance to OA. Overexposure can cause issues and death in the hive. OA, in its dried, unmixed state should be kept in a cool dry place and will not expire or diminish in strength. Once mixed, the solution will last up to a week at room temperature and a few months in the fridge. Should the solution turn to a tan/brown or smell funny discard immediately. This discoloration means an alternate chemical [HYDROXYMETHYLFURFURAL] is forming and toxic to bees.